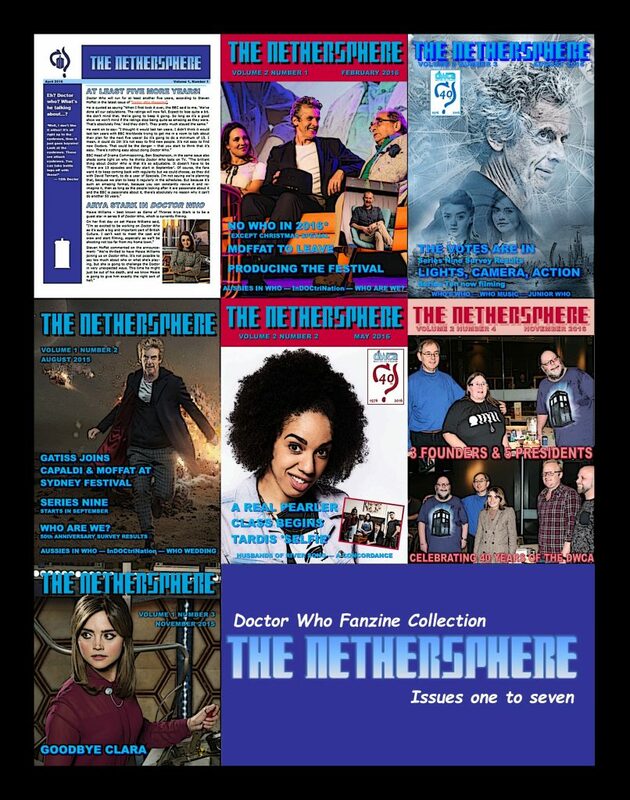 All seven issues of the Doctor Who Club of Australia’s fanzine The Nethersphere have been collected here in one volume. Featuring news, reviews, articles and interviews, these issues cover the full scope of Australian fandom throughout 2015 and 2016. These pages contain a wealth of information for fans everywhere, drawn together as a labour of love by editors Dallas Jones and Roger Reynolds. This is the black and white edition. Highlights include stories by David Harris, Daniel Worsley and Darran Jordan, behind the scenes at a Whovian wedding, behind the scenes on Robert Smith?’s celebration of ten years of modern Who – Outside In 2, survey results, Robert Lloyd’s meeting with Karen Gillan, a comprehensive alphabetical listing of Australians in Doctor Who, crossword puzzles, Paul Vanezis’s report on the Sydney Doctor Who Festival, a concordance of The Husbands of River Song, reporting on Comic Con, articles on the music of Doctor Who, the Forbidden Planet launch of the Target exhibition, behind the scenes at the 40th anniversary celebrations of the DWCA, an interview with Doctor Who comic artist Chris Wahl and much, much more! All seven issues of the Doctor Who Club of Australia’s fanzine The Nethersphere have been collected here in one volume. Featuring news, reviews, articles and interviews, these issues cover the full scope of Australian fandom throughout 2015 and 2016. These pages contain a wealth of information for fans everywhere, drawn together as a labour of love by editors Dallas Jones and Roger Reynolds. This is the full colour edition.